The only stand up paddleboarding business in Aruba operated by instructors certified by the World Paddle Association and Paddlefit Pro. With over 20 years of experience, Aruba Surf & Paddle School aims to introduce the exciting and fast growing sport of Stand Up Paddle Boarding (SUP) to beginners of all ages in a safe and fun environment. Our certified and friendly instructors will get you paddling in no time! We offer lessons to all levels, rentals of paddle boarding equipment from leading brands and amazing tours. Private paddle boarding parties and SUP YOGA are also available. As pioneers of paddleboarding in Aruba we can proudly say that we have, by far, the best and most skilled instructors on the island and aim to provide nothing less than outstanding service. Want to escape the main beaches and see Aruba’s hidden gem? Have you ever thought about gliding peacefully along the turquoise shores enjoying the flow of the Caribbean ocean, beach life and the island scenery? How about exploring breathtaking untouched areas in Aruba by paddleboard? Join us on our Eco-Jungle tour, a favorite amongst locals, families and honeymooners who choose to see a little more of this beautiful island from a different perspective. View the full Tour description and book the best part of your holiday now! It was our first trip to Aruba and our first time paddleboarding. Dennis at was awesome! We ended up booking 2 tours with him in the 5 days we were there. Such a great way to experience the Island and to have a true professional take us around. Thank you Dennis. We will see you again! We had such a great time during our paddle-boarding session with Dennis, that we went not once, but twice within one week! It was my first time paddle-boarding, and Dennis was a great teacher, explaining the technique in a way that was easy to understand. He took us on two different tours, both exploring the beautiful parts of Aruba! 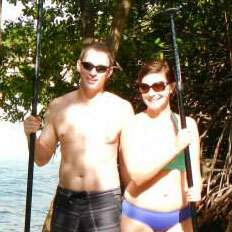 We look forward to going paddleboarding with him again on our next trip to Aruba!